For Pirelli, P Zero World represents a space that is particularly dedicated to Prestige clients: owners of sports cars or luxury cars, seeking products that are specifically designed for their cars but also service that is at a similar level to the cars themselves, in a welcoming and stylish environment. Every P Zero World store highlights Pirelli's esteemed areas of excellence, from Formula 1 tyres to the images used in the iconic Pirelli Calendar. Pirelli supplies original equipment to the majority of the world's premium and prestige car manufacturers, and P Zero World represents the perfect meeting point between brands that are very different but share the same standards of quality, elegance and performance. Pirelli is the undisputed leader in this elite sector, as well as being exclusive supplier to partners that include Lamborghini, McLaren, Dallara and Pagani Automobili, at the very top of the high-value world at the heart of Pirelli's corporate strategy. The choice of Monte Carlo as the location for the third P Zero World store was an easy one, as the Principality is the de facto European capital for sports and luxury cars. The store is located underground, opposite an area where a six-hectare artificial island is springing up, giving life to a brand new floating district of Monaco. In other words it's at the very heart of the Principality, ideally located to admire some of the most impressive cars in the world. Monte Carlo's new P Zero World occupies a space of 900 metres square, where as well as tyre changes, car valets and car Waxguard treatment takes place: made-to-measure services for Pirelli's prestige clients. It's only in P Zero World stores that the entire range of Pirelli tyres can be seen in one place, from motorsport products such as the P Zero Trofeo R, to tyres for motorbikes, bicycles, and Pirelli Collezione tyres for classic cars. Gaetano Trezza, Pirelli's Head of Trade and Operative Marketing, said: “The P Zero World concept is based on four principal elements: product, service, technology, and brand: thanks to which Pirelli has been able to claim leadership in the high value sector and consolidate relationships with the principal car manufacturers of the world. P Zero World represents the DNA of our company to the maximum effect, offering a unique customer experience thanks also to cutting-edge digital technology. Now our positioning in the market is underlined by another new flagship store in Monaco. After Los Angeles, Munich and Monte Carlo, the Emirates is our following destination, with the opening of our next P Zero World in Dubai. Matthieu Brinon, CEO of Pirelli France, added: “Pirelli's decision to open the third P Zero World in Monaco integrates perfectly with Pirelli's retail development strategy in the French market. This is a market that is growing significantly in the high value sector: 18 inches and higher, which has more than doubled in the last four years. Seen in this context, P Zero World is a perfect way for Pirelli to unite end-users in spaces dedicated to high value and bespoke services, where Monte Carlo and the Cote d'Azur is a natural fit”. The opening of this store was celebrated by a parade of more than 40 supercars taking part in the first road-going P Zero Road Experience: an event born in France nearly 10 years ago, but which has previously always taken place on circuits. For the inauguration of the most recent flagship store in Monte Carlo it took place on normal roads for the first time, over the stages of the legendary Monte-Carlo Rally. With the roads closed for the occasion, the participants were able to make the very most of the whole Pirelli experience, thanks also to valued partners such as Roger Dubuis and Lamborghini. The inauguration of the P Zero World store in Monte Carlo also hosted the world debut of the latest creation from MV Agusta and Pirelli Design. 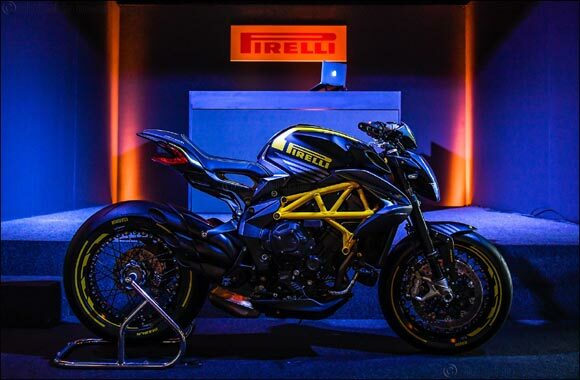 This took the form of a special edition, characterised by an unique colour scheme from the Centro Ricerche Castiglioni and Pirelli Design, aimed at complementing the lines of the Dragster 800 RR Pirelli. For the first time, Pirelli Design has personalised not only the aesthetics of the bike, but also the functional side. The fuel tank guard and fairing protection were made out of rubber deliberately designed by Pirelli's research and development department to resist the scrapes and scratches that these areas are routinely subject to, as well as atmospheric and chemical damage, such as from petrol. To clearly identify this bike as the result of a collaboration between MV Agusta and Pirelli are its Diablo Supercorsa SP tyres, which will have coloured sidewalls to match the bodywork, as an exclusive and limited edition option. For 145 years, Pirelli has been a pioneer across a number of different platforms: motorsport, best in class tyres, original equipment agreements, but also communications, art and design – thanks to a variety of assets such as advertising, the Pirelli Calendar in the Hangar Bicocca (one of the most important contemporary arts spaces in Europe) and the Pirelli Design project. Pirelli's brand identity is defined by these fusions of high tech and artistic expression, which elevates the brand beyond the tyre industry and into the wider world of lifestyle. This takes centre stage at P Zero World. The next stop is the opening of a new Pirelli flagship store in Dubai.